A THOUSAND AND ONE NIGHTS – Rimsky-Korsakov wrote the classical music’s most famous foray into the world of exoticism. His Scheherazade is clad in luxurious orchestral colors. – the fairy tales of the One Thousand and One Nights have never been told with more vibrancy! When you want to take a fantastic journey into the Far Far Away lands, there is hardly a better vessel than the orchestra. Symphonic music is peerlessly evocative. Just consider this description from our featured composition: the ship breaks up against a cliff surmounted by a bronze horseman. Now imagine the full orchestra playing that scene! 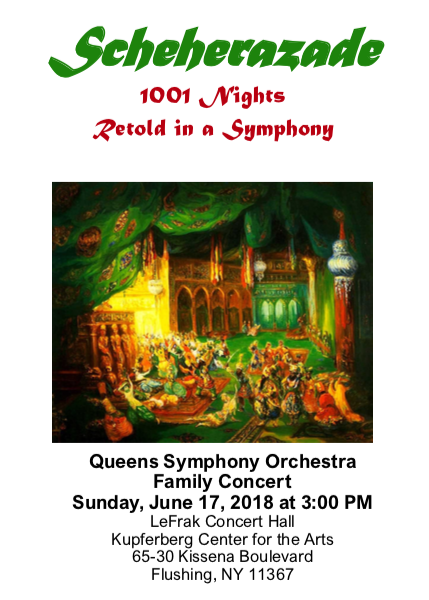 Recreating the legend of the Sultan Schahriar and the Sultana Scheherazade, the Russian Romantic composer Rimsky-Korsakov wrote the classical music’s most famous foray into the world of exoticism. His Scheherazade is clad in luxurious orchestral colors. The majestic tutti sections are intertwined with numerous instrumental solos. This is a perfect family outing – the fairy tales of the One Thousand and One Nights have never been told with more vibrancy!